Back in my college days, I had a friend and fellow journalism student who enjoyed checking out pizza places around the Sacramento area with me. We found some interesting ones, both high-end and run-down, but it never failed that after one or two bites of my first slice, he would say, “You know, there was this little place back in Jersey. Didn’t look like much from the outside, but….” As annoying as my friend’s boilerplate comment on eating a pizza was, he hit on a theme that many people enjoy bragging about: that secret place that fools all the schmucks driving by who think, “Ugh, what’s that?,” never knowing that it is the proverbial best place in town. Take Jamie’s Broadway Grille, for example. 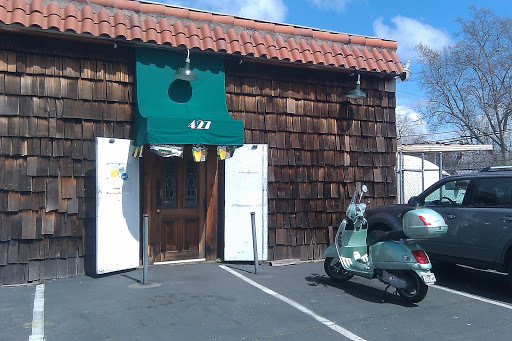 Sure, it might look like a dump from the outside, but it is no secret that Jamie’s serves some of the best food in the Sacramento region. On the first clear Spring day in weeks, my loyal Vespa carried me on a journey to Jamie’s, a local (to this scooterist) bar and grill with such an old, drab, shingled edifice that one could pass it and never know anything fit for human consumption was actually available there. Considering that it is known by the local press and residents as one of the best places to buy a burger, steak, or seafood, this collective opinion makes the building’s weather-beaten shakes and curious absence of signage (save for the street number 427 on the awning), all the more intriguing. When I walked into Jamie’s, it took my eyes a few minutes to adjust (I will have to ask a regular someday why bars are so dark). The inside of Jamie’s is not much different from the outside. Jamie’s is done up in a man-cave motif with dark wood paneling, assorted mounted heads of wild game, and beer mirrors in all directions. There is nothing fancy about the place—even the mustard bottles on the tables are plain Heinz Yellow. While I am a sucker for any business that serves hamburgers, Jamie’s is particularly well known for its steaks, beef brisket, ribs, lamb shanks, and an impressive array of seafood dishes. Having been cursed with only one stomach and needing to choose just one item from the menu, I selected the Broadway Burger with cheese: a hand-formed beef patty, American cheese (they also offer Swiss), grilled onions, romaine lettuce, tomato, and mayonnaise. The burger is presented on a sesame se ed bun, open face, with the accoutrements on the side. The mayo, sadly, was on top of said accoutrements, making assembly and the plate-to-face lift a little messy. I would have preferred that the server ask me if I wanted the mayo on my burger instead. This would have made the experience less like kindergarten finger-painting. The bun, by the way, is so good you could eat it alone—quite a find compared to most burger places around here. The patty is juicy and flavorful and is about a third of a pound. The tasty bun, with the smart choice of romaine lettuce, complements the excellent beef. The rest of the components are good if not remarkable, but that does not matter. 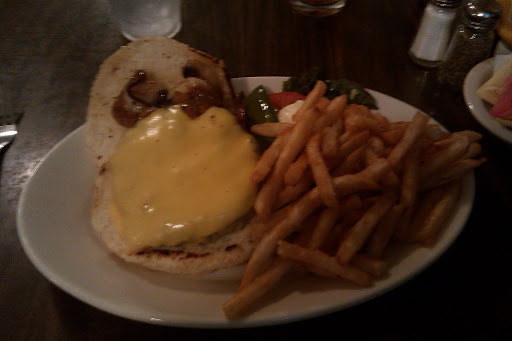 This excellent hamburger came with a firm pickle spear and crispy fries that were lightly seasoned with garlic. I prefer my pickle in between the bun, but it did not make much of a difference with this burger. The bill came to about $12 with tea and tax—not bad for a burger and fries of this quality. If anecdotal evidence from one burger lover is not enough to get you fired up about it, the fact that the dining area of this bar is consistently packed serves as a testimony to the quality of the food that lies within. When I paid my bill and left the darkness of Jamie’s lair I had to let my eyes adjust to the brightness outside before riding away. I wonder if anyone walking down the street saw me gear up and scoot away from the drab building with a roof for a front, and wonder what is in there. If they do not know they are missing out.